Seemingly unrelated cults, once quiet, have set into motion a plan that spells doom for humanity. All across the globe, they work with a singular purpose - to open the Great Gate and bring about the ruin of mankind. What malign force could have united these hitherto disparate organizations? More importantly, can they be stopped? The Masks of Nyarlathotep expansion throws the investigators into a struggle against the Crawling Chaos for the soul of humanity. In this adventurous homage to one of the greatest roleplaying campaigns of all time, seven fearless investigators join the fight that will either see them forged anew in the fires of destiny, or consumed by them. 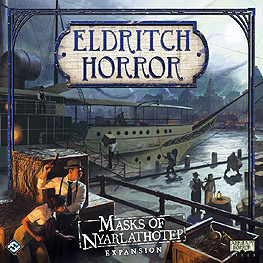 Masks of Nyarlathotep introduces investigator-specific Personal Stories, the Focus and Gather Resources actions, plus a host of additional Assets, Spells, and Artifacts to Eldritch Horror. This expansion arms the investigators with everything they need to challenge its two new Ancient Ones as well as the all-new Campaign mode. The Lord of Kadath wakes!